On September 28, 1928, Scottish scientist Alexander Fleming discovered penicillin, now one of the world’s leading antibiotic medications. 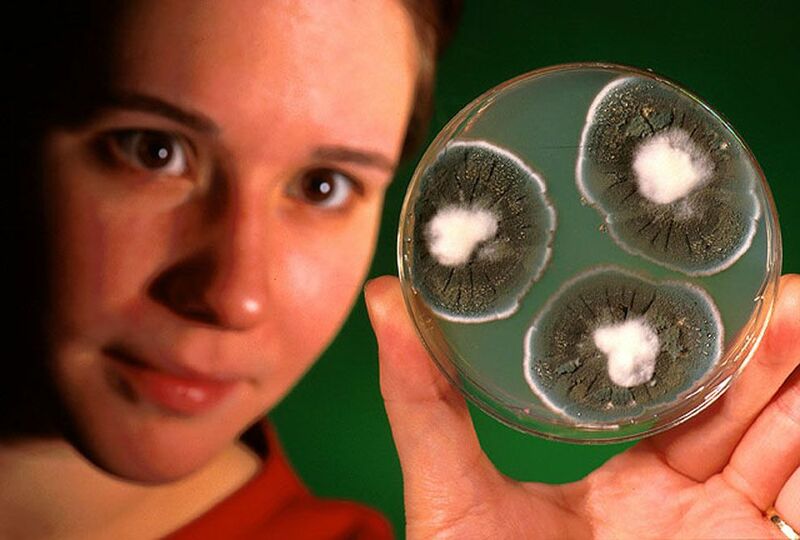 Not all species of the Penicillium mold are helpful to humanity. Newly discovered species, such as this one (held by technician Eileen Bayer) have been linked to illness in tropical areas. On September 28, 1928, Scottish scientist Alexander Fleming discovered penicillin, now one of the world’s leading antibiotic medications. Fleming had been studying a strain of bacteria (staphylococci) when he noticed that mold had developed in a Petri dish containing the bacteria. More importantly, a bacteria-free ring surrounded the mold. Fleming experimented with the mold over and over again and found that it stopped the growth of the staphylococci he was studying, as well as a wide variety of germs that cause many infections and illnesses in humans. He named the substance penicillin. It took some time for scientists to turn Fleming’s discovery into a drug, and it was not until 1943 that penicillin was produced in large quantities. Fleming won the Nobel Prize in Medicine in 1945 for his discovery. substance that can stop or slow the growth of certain microbes, such as bacteria. Antibiotics do not stop viruses. disease caused by microscopic organisms, such as bacteria.